Home / 消息动向 / Latest News / Tanner De Witt’s referee kit in action! Tanner De Witt’s referee kit in action! As some of you may know, in 2015 we signed on as Gold Sponsor of the Hong Kong Society for Referees for the domestic rugby league. We committed to a three-year sponsorship period to show our support for this integral part of sporting: referees must maintain a high level of fitness and are not always the most popular people on the pitch so their commitment to the game is particularly admirable. We felt that this partnership was especially relevant since the main aim of a referee in any sport is to guide and direct the players to ensure a fair outcome; this is something that lawyers do on a daily basis. 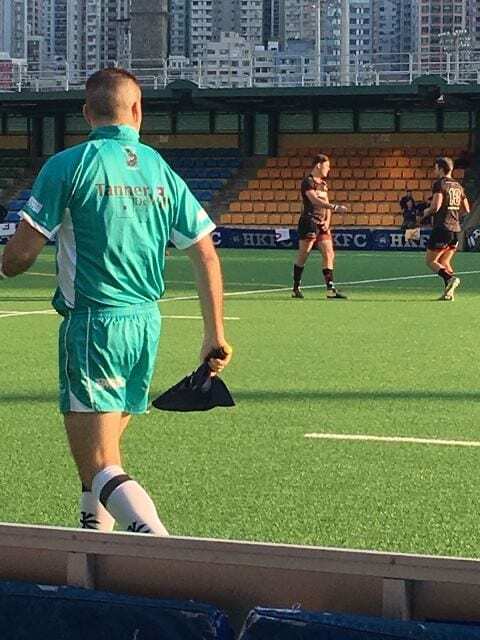 We were recently at Hong Kong Football Club to catch the Old Mutual International Men’s Premiership’s second Super Saturday of the season, and were very pleased to see the Tanner De Witt referee kit in action. The referee did a fantastic job conducting the game between the Borrelli Walsh Tigers and Societe Generale Valley, which ended with the Tigers winning 38-27!